Home » Posts Tagged "water heating project"
A solar water heater could easily save you a significant amount of money on your water heating cost. 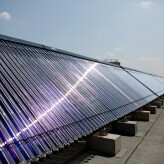 Building your own solar thermal panel for heating water is simple. In this blog, we will show you how to build your own solar water heater. Making your own solar water heater is cheap and easy. Depending on what size and what your purpose is, you could easily heat up to 70 gallons of water for showers or dish-washing or even larger volumes of water for swimming pools or commercial use, using nothing but solar power.